One of the largest river-powered hydroelectric power plants in England has been officially opened. 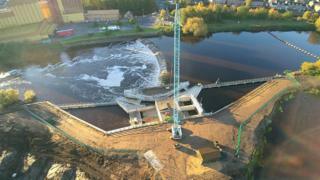 The £7.5m station on the River Aire in Knottingley, West Yorkshire, has taken 15 months to build and will generate energy for the local electricity grid. The 500 kilowatt generators will be operational for the next 100 years, according to the privately-owned developer behind the project. It was opened by ex-England cricketer and BBC commentator Geoffrey Boycott. Barn Energy said the site, half a mile downriver from the Ferrybridge power station, includes a fish passage allowing salmon, eels and other migratory fish to safely navigate the weir. Allan Leighton, chair of the Canal and River Trust, said: "It's wonderful to see the historic Aire and Calder Navigation being used in this way. "This project will help to protect the environment and bring clean energy to the local community for generations to come."